Economical, space saving, and rugged the NEW Epsilon EP Series drives offer compactability with power. Not to be mistaken for the previous Epsilon series which is fully supported and available for customers who prefer not to change their existing design. The NEW Epsilon EP's offer more power in a small package. The most compact EP drive can fit in enclosures as small as six inches deep. Unlike drives requiring external positioning cotrollers, this drive has Position Tracker built in. Easy install with Power Tools Pro software application will make startup a breeze. 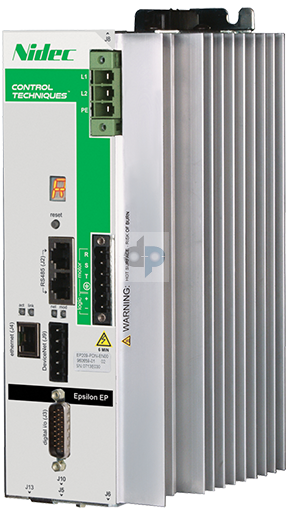 The Epsilon EP's are available in five drive sizes ranging from 2 Amp to 16 Amp, with 240 VAC input voltage. Drive configurations include Base (EP-B), Indexing (EP-I), and Programming (EP-P), with various built in options. 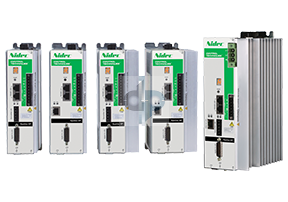 Communication protocol options include Ethernet, Modbus, DeviceNet and Profibus all built in as ordered. External additions to your Epsilon EP such as an HMI display, Ethernet port switch, breakout board, specialized cables, or shunt resistor will perfect your affordable drive package. Select a servo motor for your motion control needs and experience "Motion Made Easy". STI-SNCI SI Screw Terminal Interface, plugs directly into Epsilon EP Drive Sync IN DB9 (J10)? STI-SNCOA SOA Screw Terminal Interface, plugs directly into Epsilon EP Drive Sync Out DB15 (J5)? ETH-S4 Ethernet Industrial Switch, 4 Port, Requires 24VDC external power suppy (MLP-002-00). ETH-S8 Ethernet Industrial Switch, 8 Port, Requires 24VDC external power suppy (MLP-002-00).